Book 1 of the "Good News Shoes" series introduces us to Riley Mae, the spokesperson for a new collection of sport shoes. In Book 1: "Riley Mae and the Rock Shocker Trek", Riley realizes the importance of keeping her commitments when photo shoots and publicity events prevent her from playing softball. Riley deals a lot with friendships as her new commitments lead to conflict between Riley and her best friend, TJ, who doesn't understand her circumstance. Riley also meets (and helps) a new friend, Rusty, who is struggling financially because her dad is out of work. 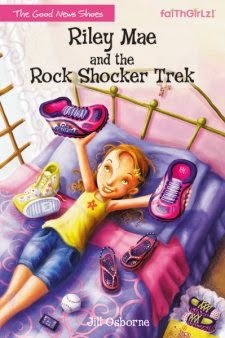 A strong theme in "Riley Mae and the Rock Shocker Trek" is the importance of praying to God about decisions and about praying to God when you are scared. I like that Riley isn't an example of perfect faith. She asks the age old question we all wonder from time to time "How do you know if God says "Yes"?". Another strong theme in the book is the importance of being prepared to share the gospel. At one point Rusty has questions about the Bible and Riley feels ill-equipped to answer them. Watching a little girl in the Sunday School class answer Rusty's questions inspires Riley to become better prepared to share the gospel with those around her. One thing that I didn't love about the book is that Riley keeps some secrets from her parents and asks others (including adults) to keep secrets from her parents. These aren't major secrets, but still kids keeping secrets is something I don't agree with. The fact that she forgot to apply sunscreen and that her new friend is without food are two examples of the secrets Riley keeps from her parents. This isn't enough of an issue to me to not recommend the book -- but it is a topic that could/should be discussed with your pre-teen when she reads the book. Another concern I have with the book is that God is referred to as "small 'h' he" instead of "big H "He". I prefer when God is referred to with a capital "H" because I think it shows more reverence. Riley learns in Book 1 that things aren't always as they seem. With the help of her friends and family, Riley uncovers a mystery -- all while experiencing an adventurous climb up Half-Dome in Yosemite. Although the cover doesn't hint at it -- mystery and adventure go hand in hand in this book. It will be sure to keep the interest of your pre-teen readers and inspire them in their faith at the same time. Sounds like a great book, my daughter would love ti! Amy, you'll have to let me know what your daughter thinks of it!